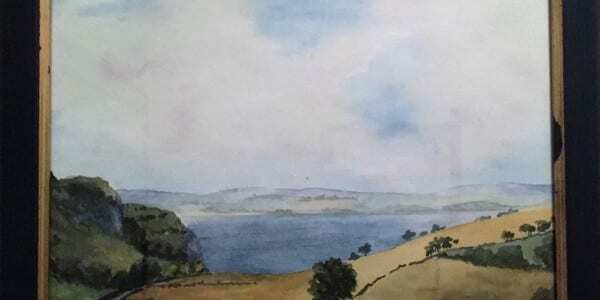 Irish Watercolor by M MacLoughlin of Irish Landscape. 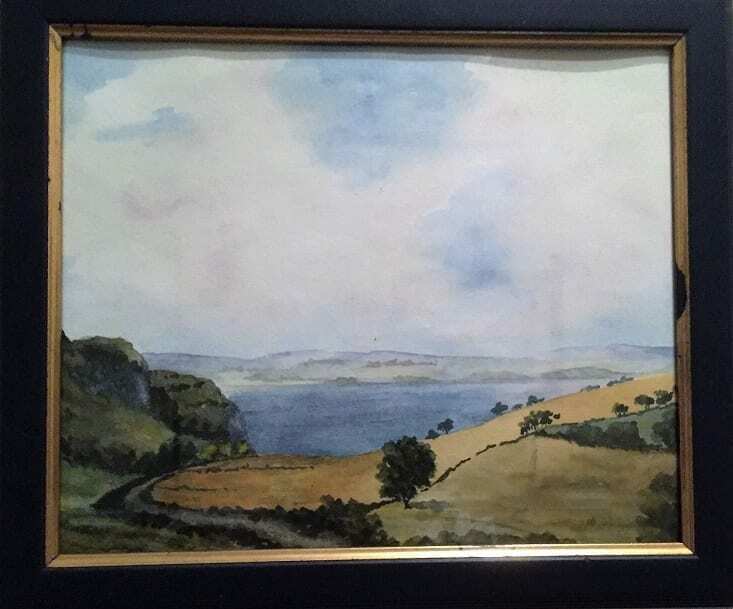 Very nice little original watercolor study of the Irish landscape by Irish watercolorist, M. MacLoughlin. WATERCOLOR PAINTING: Watercolor (American English) or watercolour (Commonwealth and Ireland), also aquarelle (French loanword), a diminutive of the Latin for water, is a painting method in which the paints are made of pigments suspended in a water-based solution. Watercolor refers to both the medium and the resulting artwork. The traditional and most common support—material to which the paint is applied—for watercolor paintings is paper. Other supports include papyrus, bark papers, plastics, vellum, or leather, fabric, wood, and canvas. Watercolor paper is often made entirely or partially with cotton, which gives a good texture and minimizes distortion when wet. Watercolors are usually translucent, and appear luminous because the pigments are laid down in a pure form with few fillers obscuring the pigment colors. Watercolors can also be made opaque by adding Chinese white. In East Asia, watercolor painting with inks is referred to as brush painting or scroll painting. In Chinese, Korean, and Japanese painting it has been the dominant medium, often in monochrome black or browns. [clarification needed] India, Ethiopia, and other countries have long watercolor painting traditions as well. Fingerpainting with watercolor paints originated in mainland China. IRISH ART: The early history of Irish art is generally considered to begin with early carvings found at sites such as Newgrange and is traced through Bronze Age artefacts, particularly ornamental gold objects, and the religious carvings and illuminated manuscripts of the medieval period. During the course of the 19th and 20th centuries, a strong indigenous tradition of painting emerged, including such figures as John Butler Yeats, William Orpen and Jack Yeats. Ireland's best known living artists include Brian O'Doherty an art historian, sculptor, and conceptual artist who is based in New York City, Sean Scully an abstract painter who lives and works in New York, Dorothy Cross, a sculptor and filmmaker and James Coleman, an installation and video artist. Interest in collecting Irish art has expanded rapidly with the economic expansion of the country, primarily focussing on investment in early twentieth century painters. Support for young Irish artists is still relatively minor compared to their European counterparts, as the Arts Council's focus has been on improving infrastructure and professionalism in venues. That said, Ireland's unique tax break for creative artists (writers, visual artists and composers) has encouraged a wide community of artists to remain in Ireland.